Data Studio is Google's free next gen business intelligence and data visualization platform. Community Connectors for Data Studio let you build connectors to any internet-accessible data source using Google Apps Script. You can build Community Connectors for commercial, enterprise, and personal use. 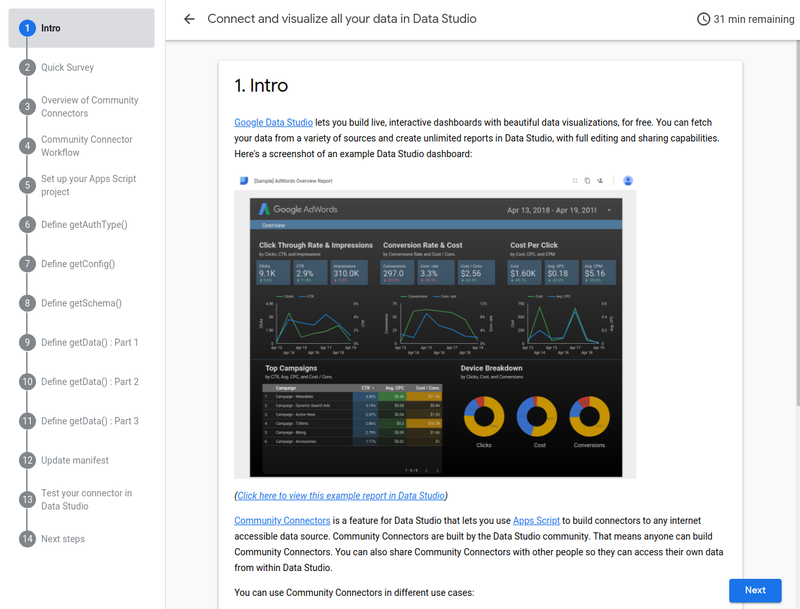 Learn how to build Community Connectors using the Data Studio Community Connector Codelab. If you provide a web based service to customers, you can create template dashboards or even let your users create their own visualization based on the users' data from your service. You can build your own connector to any preferred service and publish it in the Community Connector gallery. The Community Connector gallery now has over 90 Partner Connectors connecting to more than 450 data sources.